The bathroom has become so much more than just a functional space and is now a place where we’re spending increasing amounts of time to relax and rejuvenate. Being able to escape the stresses of everyday life is becoming more and more important and having your own spa bathroom can help you wash away your worries as regularly as you need. A beautiful, freestanding bath will not only provide a stunning centerpiece for your bathroom, but it will also allow you to enjoy a luxurious soak to help you unwind at the end of a long day. Our beautiful Claremont slipper bath features grand styling and, with its choice of chrome, white or black feet, it will steal centre stage in any spa-style bathroom. It is made from double-skinned acrylic and has great thermal properties, which will help keep your water warmer for longer allowing you to enjoy indulgent soaks. If you prefer stepping under a hot, powerful shower and letting the water rinse away the stress of the day then you’ll love our Clifton exposed dual function shower, which would look right at home in your favourite spa. Keeping your bathroom neat and clutter free is key to setting the scene and ensuring it retains its Zen-like ambiance. Cool and contemporary, our Monograph basin units have two soft-close drawers to provide ample storage for all your bathroom essentials. They come in two, on-trend, sophisticated, neutral shades of light clay and gloss white, which will also help to create a calm and relaxing environment. 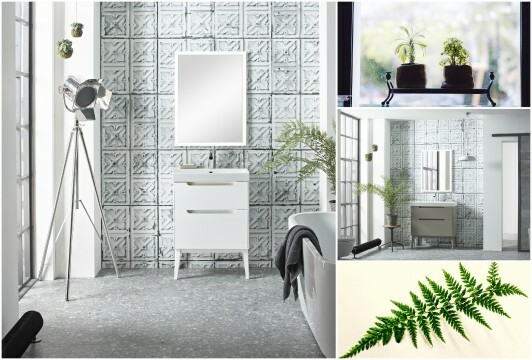 Introducing some greenery will instantly bring a soothing, natural feel to your spa-style bathroom and inject some colour to your home at the same time. Indoor plants such as ferns are ideal as not only do they look fantastic, but they can help to purify the air and enhance your feeling of wellness. The plant of choice for many boutique spas, a beautiful orchid will also thrive in hot and humid bathrooms. If you’re short on floor or shelf space, hanging plants from a wall or ceiling will work just as well and create a real feature. 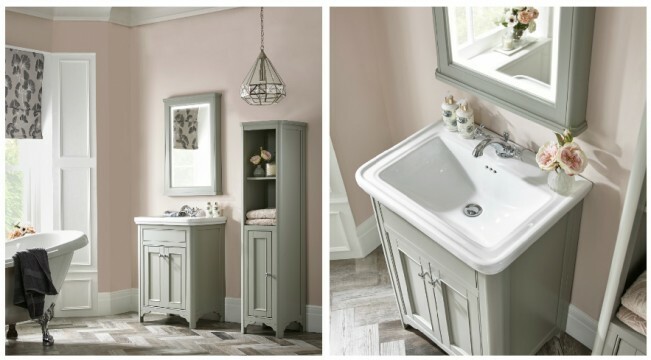 Colour is key if you’re looking to transform your bathroom into a nurturing, relaxing oasis. Choose soft, warm modern neutrals that will add a calming ambiance. Walls painted in dusty pinks such as Laura Ashley’s Pale Amethyst or tiled in soft white will work perfectly and will look stunning when teamed with furniture, such as our Langham range, hand painted in steel grey or cotton white. 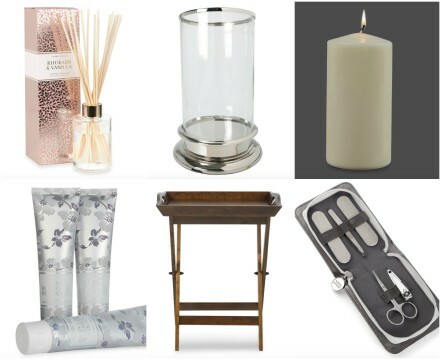 A stylish and practical table to store some indulgent accessories will ensure your lotions and potions are easily accessible for regular pampering sessions. Treat yourself to a stylish mini manicure set, and don’t forget to light a scented candle to really set the mood and aid relaxation.